Thanks to my friend Giya for giving me The Summoning for my birthday! I’ve been curious about this book for some time because I’ve seen lots of copies of it in the local bookstores. I moved it up in my reading list when one of my groups in Goodreads decided to pick this for our monthly read. Chloe Saunders sees dead people. Yes, like in the films. The problem is, in real life saying you see ghosts gets you a one-way ticket to the psych ward. And at 15, all Chloe wants to do is fit in at school and maybe get a boy to notice her. But when a particularly violent ghost haunts her, she gets noticed for all the wrong reasons. Her seemingly crazed behaviour earns her a trip to Lyle House, a centre for ‘disturbed teens’. At first Chloe is determined to keep her head down. But then her room mate disappears after confessing she has a poltergeist, and some of the other patients also seem to be manifesting paranormal behaviour. Could that be a coincidence? Or is Lyle House not quite what it seems…? Chloe realizes that if she doesn’t uncover the truth, she could be destined for a lifetime in a psychiatric hospital. Or could her fate be even worse…? Can she trust her fellow students, and does she dare reveal her dark secret? Oh and according to the website, there are excerpts available online so you can check it out before deciding if you want to buy it or not. I must say that this line “Chloe Saunders sees dead people.” strongly reminded me of the movie Sixth Sense. I’m a huge baby when it comes to horror movies (or horror stories for that matter) and I don’t watch/read them as much as possible. I was actually a bit scared when I read the prologue and the first few chapters of this book because it talked about ghosts but I got over it. I was really interested in the premise because I haven’t read a book with a main protagonist who can see ghosts but I didn’t really get into this book. I got put off by Chloe’s narration and the way she kept asking questions in her mind. I get that she’s confused by everything that’s happening but I felt like it felt too long for her to figure things out and I had to wait before things could be revealed. That said, the latter part of the book was faster-paced that the earlier part. When I got near the end, I stayed up reading because I wanted to finish the book. Again, this is probably just a case of “this book wasn’t meant for me” because I’ve heard good things about it. 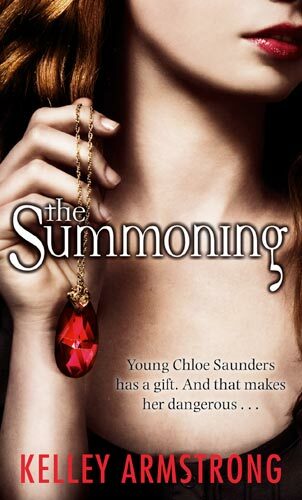 I am curious as to what will happen next to Chloe because the book ended on a cliffhanger but it’s not like I want to rush out and buy The Awakening. *sigh* I’ve yet to find an urban fantasy series to love. Lament, I have high hopes for you! I haven’t read all of Diana Wynne Jones but I really liked Howl’s Moving Castle so I thought it’s about time that I read her other books. I just finished reading The Chronicles of Chrestomanci, Volume I: Charmed Life / The Lives of Christopher Chant, which I got from Celina. This volume contains the first two Chrestomanci books and I’ve heard good things about this series. Cat and Gwendolen were orphans, and when an old friend of their father’s, the mysterious Chrestomanci, came visiting and offered to adopt them, Gwendolen, who was already studying Advanced Magic, knew that she was destined for Great Things – for hadn’t the Fortune-Teller predicted that one day she’d rule the world? Cat, who had never been able to manage turning brass buttons to gold, wasn’t so sure he was going to enjoy his new life. But then what he thought didn’t count for much. Ancient and turreted, Chrestomanci Castle was every bit as grand as Gwendolen had hoped. But there were disappointments. No butler opened the door to her, no lavish banquets were given in her honour. Instead, she and Cat had to do lessons in the schoolroom with Chrestomanci’s two children, and worse of all she was forbidden to practice magic except under supervision. In fact, she wasn’t being treated with the respect she deserved, and she very quickly decided to do something about that. It was difficult for Cat, who clung to his unpredictable sister as the only familiar person left in his life, especially when he guessed that Gwendolen was planning to go to far, and he didn’t see how he could stop her. He didn’t realise, though, quite how ambitious Gwendolen’s ultimate plan was, nor how closely he himself was involved in it. This is the first book in the Chrestomanci series and introduces readers to the Twelve Related Worlds. Even though I haven’t read a lot of Diana Wynne Jones, I think it’s safe to say that all of her books are similar in the sense that they all have magic, adventures, interesting characters and a lot of humor. I wish I found out about her books when I was younger. I think I would’ve loved her books as a child. In any case, I still enjoyed reading them as an adult so it’s all good. In Charmed Life, the main character is Eric Chant, nicknamed Cat. Cat thinks he can’t do magic and he’s used to being bossed around by his sister Gwendolen, who’s destined to be a great witch. This book isn’t as fast-paced as other Diana Wynne Jones and you tend feel sorry for Cat because he’s clueless most of the time. What I really liked about this book was the characters in Chrestomanci Castle – Chrestomanci himself, his wife Millie and their kids Julia and Roger. Chrestomanci reminds me of Howl because of the way he dresses although he does have more extravagant tastes when it comes to dressing gowns. I felt like this book was more of an introduction to the world than anything else. It did make me look forward to reading more about the world and the characters in the series. Christopher often makes night-time trips to the Twelve Related Worlds. He thought there was nothing unusual about this until his Uncle Ralph hears of it and sends him on mysterious missions. One such mission reveals Christopher’s very special magic powers – gifted with nine lives, he is destined to become the next Chrestomanci, the greatest magician in the country. Christopher goes to study at the formidable Chrestomanci Castle, but even here he is not safe. Outside, the forces of evil are poised for attack and Christopher is losing his lives at an alarming rate. Can Christopher defeat his enemies alone, before his remaining lives run out? The Lives of Christopher Chant occurs a couple of years before Charmed Life and it’s about the childhood of Christopher Chant, the Chrestomanci in Charmed Life. I liked this one better than the first book, Christopher have more adventures as a child than Cat did in the first book. Christopher’s back story is much more engaging than Cat’s. One thing they have in common though is that initially, both of them thought that they couldn’t do any magic when in fact, they’re both destined to be powerful enchanters. Although Christopher couldn’t do magic, he can travel between the worlds. His travels are very interesting and they show how diverse the worlds really are. I enjoyed reading about his escapades and I had a couple of laugh out loud moments with this book. The way he kept losing his lives one after the other was hilarious. As with the first book, the characters in this one also had remarkable personalities and they add more depth to the story. If you haven’t given Diana Wynne Jones a try, I definitely recommend starting with either the Chrestomanci books or Howl’s Moving Castle. I’ve heard about Beastly a couple of years back but I haven’t been able to find a copy. I’ve always been curious though. Thanks to muntingprinsesa who gave me the book, I finally got to read it. I’m always curious about Beauty and the Beast retellings. This is different from the other retellings that I’ve read because it’s set in modern-day New York City and told from the point of view of the Beast. The only other retelling narrated by the Beast that I know of is Beast by Donna Jo Napoli. This is unusual because the story starts before the transformation. So readers get to find out what the Beast did to deserve the curse as punishment. In Beastly, Kyle Kingsbury is popular, handsome, has a rich dad and knows that he’s living the perfect life. He’s also a snob, looks down on people who he thinks doesn’t deserve his attention and judges people based on their looks. A witch in his class wants to teach him a lesson so she casts a spell on him. Unlike the Beast in other retellings, Kyle only has two years to find a girl to love and break the curse. Depressed that he lost his so-called perfect life, Kyle moves to a huge Brooklyn house with just a blind tutor and their housemaid. He even changes his name to Adrian, which means darkness. I liked the modern setting of the story and that Kyle/Adrian is just a teenage boy. During his isolation, he watches DVDs and goes online to chat with a transformation support group. These chat logs in between chapters are pretty funny. One common thing that I noticed is that in these retellings, the Beauty of the story always likes to read books. Lindy, the Beauty in Beastly, is no different. I just wish there were more anecdotes on the interaction of these two characters. I didn’t feel like their relationship was fully developed. All in all, it was still pretty interesting to read a different kind of Beauty and the Beast retelling. I recommend this for fans of fairy tale retellings. Check out Alex Flinn’s website for an excerpt of the book. The prologue and the first chapter is there. There’s also a preview of the movie. I hope they show the movie here when it’s released. I want to watch it. The cast of characters is pretty interesting though. Alex Pettyfer plays Kyle, Vanessa Hudgens plays Lindy (the Beauty of the story), Mary-Kate Olsen plays Kendra (the witch) and Neil Patrick Harris plays Will (Kyle’s tutor when he becomes the Beast). Isn’t Lindy supposed to have red hair? And it’ll be interesting how NPH will act in this movie. But increasingly, adults are reading YA books with no ulterior motives. Attracted by well-written, fast-paced and engaging stories that span the gamut of genres and subjects, such readers have mainstreamed a niche long derided as just for kids. I’m really glad that YA is getting the distinction it deserves. It’s such an incredible genre with a wide array of choices. It’s no wonder my TBR keeps on expanding. Now the Goodreads thread and the article made me think – I’ve never really experienced that people look down on me because of what I read. Maybe because a lot of my friends don’t read and all they know is that I like to read, they have no idea that I like fantasy or YA. I think only a handful of people know the kind of books that I like. Most of my friends don’t even read my blog because they say it’s mostly about books and they won’t be able to relate. The friends that I have who like to read also read YA and fantasy from time to time so I think they understand why I like it so much. Although I do have a good friend who calls YA books “snacks” and other novels “full meals”. You know the saying don’t judge a book by its cover? I guess the same goes for readers, don’t judge a reader by his/her books. We all have different tastes and that is reflected on book choices. Even with book lovers who generally like the same genre will still feel differently about certain books. I’ve experienced being disappointed in books that were highly recommended by people who like the same kind of books that I do. Sometimes it also depends the reader, like on his/her mood and on the kind of books that he/she knows. I mean come on, there was a time when I didn’t know any better and my reading was comprised of Sweet Valley and Babysitter Club books. Thank goodness an aunt took pity on me and gave me my first two Newbery-awarded books. After that, I began collecting as many Newbery books as I could. But maybe that’s just me. I’d love to hear what other people think. Do you judge other people based on what they read? Do you get judged based on what you read? I’ve been craving for some YA romance lately, you know the type of book with just the right amount of kilig factor (how does kilig translate to English? Swoon factor?) and I got it with Going Too Far. I was really excited when I found it in Fully Booked because I’ve seen a lot of good reviews about it. I didn’t even mind that at P440 for a paperback, it was a little more expensive than what I usually buy. Plus I got it on sale for 20% off. This is the kind of book that you finish in one sitting, the kind of book that you’ll stay up late at night reading because you want to know how it ends. Unputdownable so to speak. It’s a classic story of bad girl meets good boy but with much more complicated characters. Meg is the only blue-haired girl in their small town and she can’t wait to finish high school and go off to college, even if it’s only in Birmingham, 20 minutes away. John is a high school graduate, who went to police academy and stayed in town to be a cop. They both have their own reasons for being who they are and doing the things that they do. It was just so much fun watching them unravel and discover each other’s inner workings. The story is told from Meg’s point of view and some of the things that she says are so hilarious. She keeps saying “I am full of fear” whenever she’s scared. And I really like this line that she said about her and John: “I guess we both understood that our relationship was built entirely on witty repartee, and neither of us thought we could be witty on four hours of shut-eye.” Meg really is a great girl and even though she’s done a lot of wild things, you couldn’t help but understand why she was doing those when you find out her reasons. And Johnafter! Oooooh hunky Johnafter. I think it’s safe to say that I’ve added another one to my list of literary crushes. It’s so not true that nice guys finish last. Isn’t it obvious that I love this book? I recommend it for all YA fans out there! Now I want more YA romance books! I’m already looking for Perfect Chemistry by Simone Elkeles and its sequel Rules of Attraction but all the bookstores here don’t have these in stock. Would you happen to have a highly recommended YA romance book? Feel free to leave a comment so I can take note of it! Another book for the Pursuing the Lioness challenge hosted by Chelle over at Tempting Persephone. This is the last book in the Protector of the Small quartet by Tamora Pierce, featuring Keladry of Mindelan. Again as I mentioned earlier, although this book explains previous events that occurred in other books in the series, it’s still better to read them in order to get a better grasp of the story. It’s amazing how the first book, First Test starts with Kel being ten and wanting to be a page and Lady Knight starts with Kel as an eighteen-year-old lady knight. If you read the series, you can really watch Kel grow as an excellent lady knight and still retain the traits that she had when she was a child. And as Kel grows, her story grows with her. This last installment in the series is more meaty than the others. With the realm at war with the Scanrans, all knights are assigned different roles that suit their capacity. Kel has been assigned to command a refugee camp. They know that Kel will do a good job because she’s one of the few nobles who care about civilians and common people and she’s already proven that she’s a good leader. Although the job is hard and people still question Kel’s abilities (now based on her age and experience and not as much as her being a girl) and she would much rather be in battle than in a refugee camp, Kel handles the camp the way she does everything – with very capable hands. Her dilemma comes in when the Chamber of Ordeal keeps reminding her of the quest that it gave her at the end of Squire. It comes as no surprise though that she’s able to fulfill her destiny and more than what was expected of her. I don’t want to say anymore and give out spoilers. Suffice to say that Kel really deserves her legendary title – the Protector of the Small. Just more general thoughts about Kel. She’s the third Tamora Pierce heroine that I’ve read about, the first two were Alanna and her daughter Aly. Both Alanna and Aly had magical abilities and they were both god-touched. Kel wasn’t like that, she proved that she’s normal and in order to get to where she wanted to go, she works hard just like everybody else. I’m glad that Kel inspired a lot of younger girls to become lady knights as well. I plan on quite a few more Tortall books, and heaven knows what they’ll all be about. Right now I’ve got two Numair books, then Maura’s book under contract. After that will come one or two more books about Kel. After that I’m not sure about the order, but the books I definitely have planned are ones centered around Aly, Dove, and Dove’s choice of a consort; the lives of Aly’s children, particularly Ochobai, who is a Little Person; Neal’s daughter, who will go for her knighthood in a time when there are far more girls training as knights than there were in Kel’s day. There’s also Daine’s children Sarralyn and Rikash, who have to find their way. Rikash will be telling that story, because I’m terrified of his sister, but he isn’t. Yay for more Tortall books! Now, I’m really itching to read Daine and Numair’s story. More books for the Pursuing the Lioness challenge hosted by Chelle over at Tempting Persephone. After reading First Test, the first book in the Protector of the Small series, I breezed through the next books so I thought I’d do one post about the next two books. Although past events are explained in this book, I recommend that the series be read in order. Page continues with the remaining years of Kel’s training as a page. This book contained three years worth of action as compared to First Test, which only spanned Kel’s year on probation. In the first few chapters of Page, Kel had to deal with the same problems that she had in First Test – mainly the same bullies – but she also has a loyal set of friends who believe in her and even the training master, Lord Wyldon, has reluctantly realized that Kel is one of the best pages in training. An encounter with bandits during summer camp shows Kel’s potential as a commander and prompts a change in the pages’ training. Kel is a good leader because she’s very levelheaded and sensible and even during a fight, she keeps a cool head. It’s also interesting to note that while she gets a lot of action while training as a page, Kel was also dealing with changing from a girl to a young woman. And not just physical changes at that, also developing a crush on one of her closest friends. Although she knows that she has to accept the physical changes that come with growing up, she doesn’t like them and thinks they’re a nuisance. She’s also bewildered with having a crush and doesn’t know what to do about it. It’s nice to know that even a big hero like Kel has the same problems as normal people. Near the end of the book, Kel has to make a huge decision. I don’t want to give spoilers but let’s just say it involves her final exam as a page. Page is a fast-paced coming of age story that’s closely tied to First Test. Sorry for the long quote, couldn’t really chop it up. I really liked Lord Raoul, he’s a great mentor and just the right one to handle Kel. I love the dynamics of their student-teacher relationship and how they both respect each other and the easy camaraderie that they have. With the serious and conservative Lord Wyldon as her training master during her page years, Kel deserved to have an easygoing knight-master. I also liked Kel’s interactions with the rest of the King’s Own and how she earns the respect of even the most cynical of them. The rest of Kel’s friends are still present although she doesn’t get to spend as much time with them while they’re all squires assigned to different knight-masters. Kel also develops a romantic relationship with a fellow squire. This isn’t entirely unexpected and even though Kel knows that she wants to settle down and have a family someday, she doesn’t want anything to interfere with her goal of becoming a knight. I enjoyed and recommend all of the books in this series, I’ve already finished the last book, Lady Knight but I’ll do a separate post about it. What I regret though is that I haven’t read Tamora Pierce’s Immortals series. I want to read more about Numair and Daine! As soon as I make a significant dent in my TBR pile, I will hunt for these books. Also, can I just say that I love the covers in the Protector of the Small edition that I have? They’re just so pretty and I love that each book has its own color. I like these better than the other covers of the series that I’ve seen. I decided to join the Pursuing the Lioness challenge hosted by Chelle over at Tempting Persephone because I really liked the Tamora Pierce books that I’ve read. Click on the link to check out the rules but basically just read anything by Tamora Pierce and write something about it. I’ve been excited to read the Protector of the Small series ever since sofa_rocker gave me the books for my birthday. I’ve been trying to get these books but I never found all of them in one place and I wanted to buy the entire set before diving in to read. That’s why I was happily surprised when I got the four books. I just finished reading First Test and decided to write my thoughts about it. I really liked Alanna’s story in the Lioness Quartet and I loved her daughter Aly in the Daughter of the Lioness Duology. I’m glad that there’s a follow-up series on the first lady to train as a knight because Aly’s story was set in a different location and she had a different set of skills. The story starts with ten-year-old Kel, who wants to train as a knight. Kel looks up to Alanna the Lioness and her mother, Lady Ilane, who’s also a warrior woman. Although she thinks it’s unfair that she has to go through a year of probation, Kel is determined to show everyone that she deserves to be a knight. At the beginning of the story, Kel reminded me a lot of Inda in Sherwood Smith’s Inda series (another awesome series) because they’re both ten when the story starts and they both go off to train in a school for warriors. Also, the first lesson that they learn is how to fall. And just like Inda, Kel is wise for her years. Today’s the last day of March so time for the monthly update. It’s also the last working day of the week because it’s Holy Week and Thursday and Friday are holidays. Woohoo, more reading time! Thanks to Tidoy for the two books! I plan to read these for the Once Upon a Time challenge hosted by Carl over at Stainless Steel Droppings. The rest of the list under a cut!